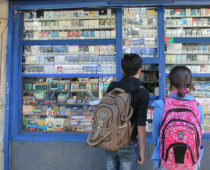 Tobacco companies aggressively block, weaken, and undermine policies designed to protect public health and reduce tobacco use, and at times they may work outside of Japan’s laws. #JapanTobaccoInternational is being accused of corruption in Japan. I support an immediate government investigation into these allegations! In Japan, Japan Tobacco International allegedly established the Smoking Research Foundation (SRF), a research-funding institution to influence science and health policy in Japan. Tobacco Control: "‘The industry must be inconspicuous’: Japan Tobacco’s corruption of science and health policy via the Smoking Research Foundation"